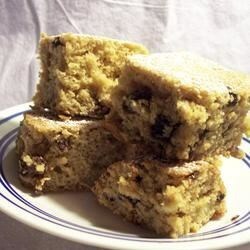 "This recipe is like banana bread, but is a moist snacking cake. Apple juice can be substituted for the rum, and pecans for the walnuts." Preheat oven to 350 degrees F (175 degrees C). Lightly grease an 8x8 inch baking pan. Place the raisins and rum in a microwave-safe bowl. Place in the microwave and cook on High for 1 minute. Set aside until needed. Bake in preheated oven until the top is golden, about 30 minutes. Cool in the pan 10 minutes before cutting into bars and transferring to a rack to cool completely. Dust with powdered sugar. These were fantastic! Very moist, kept for days. I will be making this instead of banana bread from now on! It seemed pretty dry to me. I think it needs more banana to help give it some bouncy and moist texture. Perhaps adding some milk or cream would help as well.